In an earlier post in this blog, I had covered the earliest appearances of Donna, the initial incarnation of Donald's girlfriend Daisy, in Britain's Mickey Mouse Weekly in 1936-37. 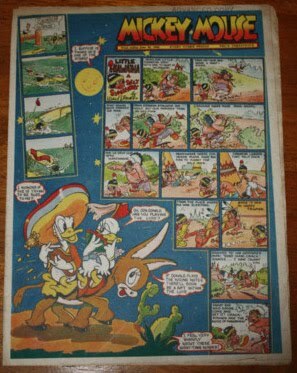 Interestingly, Daisy seems to have been ignored by the British artists of MMW as Donna continued to make appearances in MMW after Daisy became Donald's steady girlfriend in US newspaper strips from 1940 onwards. The above image is of the cover of no. 312, dated June 20th, 1942. The cover illustration is inspired by the cartoon short Don Donald (1937) where Donna had debutted.